These seniors enjoy each others company while they walk for exercise. In this article we will discuss how to help seniors coping with loneliness, and also things they can do to stay active and fit. Isolation is extremely common in the older population, and the end result could be detrimental to your loved one’s mental health and cognitive functioning. By better understanding the risks of social isolation and taking proactive measures to combat it, you can help your elderly family members enjoy their golden years. According to the University of California, San Francisco, 18% of senior citizens live alone. About 43% of these seniors report that they feel lonely on a regular basis. Seniors who reported feelings of loneliness were at a 45% greater risk of mortality. Isolated seniors were also shown to have a 59% greater risk of physical and mental decline compared to their peers that were more socially active. 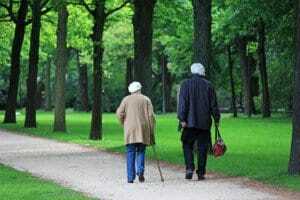 Feeling lonely has been linked to quicker cognitive decline and poor cognitive performance in the elderly. Social isolation and loneliness among the elderly has been connected to an increased incidence of certain conditions and illnesses, including arthritis, depression, impaired mobility, and chronic lung and breathing diseases. Loneliness and isolation are major predictors of the elderly needing home care, including entering nursing homes. If you have an aging parent, preventing isolation should be a major priority in order to minimize some of the physical and emotional risks of loneliness. Fortunately, there are several steps that you can take to keep your elderly loved ones engaged and connected with the outside world. When your parents were more independent, you may have only checked in via phone on a monthly basis. However, now that they are getting older, it is time to bump up the frequency of your contact, both by phone and in person. Certain life events, such as losing a spouse or special friend, no longer being able to drive, or hitting a milestone birthday often signal the need to check in more frequently. In-person contact can also go a long way in reducing the effects of loneliness. Check with your county’s local Human Services Department to see what resources are available for seniors in your area. Many communities have senior centers and other programs designed to help the elderly connect with others and make friends. Social games like bingo are a good option, as are congregate meal sites. Many organizations even offer transportation to make it easier for people to attend these functions despite physical limitations. Your aging loved one might not be the most tech-savvy person, but that doesn’t mean that they can’t learn how to use something that can make it easier to stay connected with you, friends, and other family members. Work with them to learn the basics of working a computer and programs like Skype, and teach them how to use Google. These resources will help him to stay connected with the outside world. If your aging parents are dealing with loneliness, they may be more susceptible to falling victim to a scam or identity theft. To combat this, talk to your parents about contests, lottery entries, and phone calls that they might receive that could be phishing for personal information. If you are available to visit in person, check through their mail to look for contest entry forms or other concerning documents. Another big problem among the elderly is lack of exercise, which is also something that can help them avoid loneliness since they can do physical activities with friends and family. Staying active and fit can also help them live an even longer life than they already have. There are many fitness activities that are perfect for seniors since they are not too strenuous, some of these include walking, tai chi, swimming, and even shuffle board. An active lifestyle for seniors is also especially important because it helps prevent common problems such as heart disease, diabetes, and even some types of cancer.